To create a menu, navigate to Publications > Settings > Menus and select Add. To get started enter a name for your menu in the Details section followed by the Save button at the bottom of the page. A menu structure section will then display (the menu will default to black but this can be changed) and you can start to add menu item types by selecting Add New. Find out more about menu item types here. Menu settings can be configured, such as background and text colour. Specify a name for the menu. This field is required. Set whether this menu should be automatically assigned to new publications. Prevent this menu from being selected again in future by making it unavailable. Any publications using the menu will be unaffected. The menu can still be edited and unhidden at any time. Set the main colour of the menu. 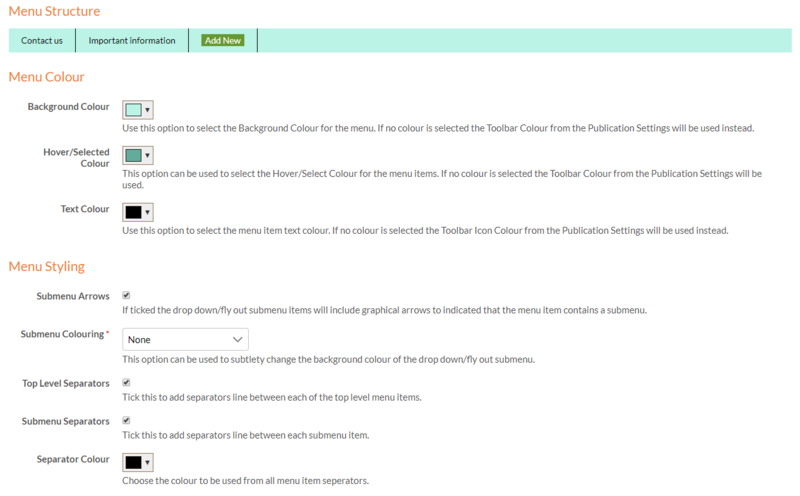 If no colour is selected, the toolbar colour from the publication’s style/appearance settings will be used. Select a hover colour for menu items. This colour will show when the reader hovers over or touches the menu item. Specify the colour of the text in the menu. This colour is the same for static and hovered/selected menu items. 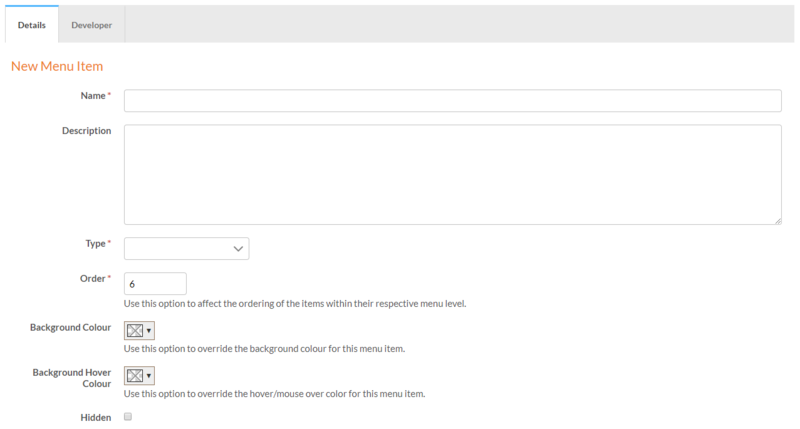 Ensure your chosen text colour is legible over the background and hover colour of all your menu items. If ticked the drop down/fly out submenu items will include graphical arrows to indicated that the menu item contains a submenu. This option can be used to subtlety change the background colour of the drop down/fly out submenu. Tick this to add separators line between each of the top level menu items. Tick this to add separators line between each submenu item. Choose the colour to be used from all menu item separators. Create your menu in this section. A preview of your menu will load and you can select the Add New button to add menu items. Once selected the menu item page will open. Name the menu item, this is also the text that will be displayed in the button. Select the type of menu item you would like to use. For more information on what item types are available, click here. Specify the position of this item in the menu/submenu. Entering a new number in the order field will only update the order number for this menu item. Other items will not update. Having two items in a menu/submenu with the same number may yield unexpected results. Set the background colour for this menu item. If no colour is selected, the menu item will not override the menu background colour set. Set the hover colour for this menu item. This will override the hover colour set for the whole menu. Remove this item from the menu. This does not permanently delete the item. Select Save to add the menu item to your menu. A menu item can be reviewed and edited by selecting it from the menu. You can also delete an existing menu item, but please note there is no undo feature for this action. If you would like to create a derivative of an existing menu, select Edit for the menu you would like to duplicate and use the Save As feature at the bottom of the edit screen. Specify a unique name and select Save As.